Mushrooms. Is there anything better than mushrooms fried in butter?! With garlic of course. Well, this sourdough toast with both mushrooms and gooey melted brie is certainly a contender. It’s definitely for the colder parts of the year, but it’s sooo good! The perfect little evening indulgence on a cold and windy day. Put the dried mushrooms in a bowl and cover with warm water. Fry the sourdough in butter on medium heat until golden on both sides. Drain on kitchen towel. Squeeze the excess water out of the no-longer-dry mushrooms. Fry together with the fresh mushrooms in butter and oil on medium-high heat until nicely browned. Add the garlic and rosemary. Fry for a minute or so. Add salt and pepper. Place the fried sourdough on a parchment paper covered oven tray. Top with the fried mushrooms and put the slice of brie on top. Place in the top of the oven in 200C, until the cheese has melted, approx 5 mins. Plate and garnish with a sprig of rosemary. Pret A Manger sells a small baguette with egg mayonnaise and bacon that I sometimes have for breakfast and that’s of course where I found the inspiration for this lovely breakfast. The crispy toast (with salted butter), smooth egg mayonnaise with plenty of flavour and savoury pancetta is such a great breakfast I’ve already had it two mornings in a row for breakfast. NB. I prefer runny eggs in general but that doesn’t work in egg mayonnaise, therefore I boil them for seven and a half minutes so the yolks are set but still very yellow and creamy. If you prefer your eggs hardboiled please boil them for longer. Also, I prefer white pepper to black in subtle (non-Italian or meat) dishes, but again, it’s up to you to decide what you prefer. Bring water to the boil in the saucepan and place the eggs in the pan. Boil for seven and a half minutes. Drain and cover the eggs with very cold water. Drain once the eggs are cool and place in fridge for an hour to cool some more (makes it easier to peel them). Peel the eggs and chop with a sharp knife. Mix mayonnaise with mustard and add the chopped eggs. Season to taste with salt and white pepper. Keep refrigerated. Toast the bread and butter it. 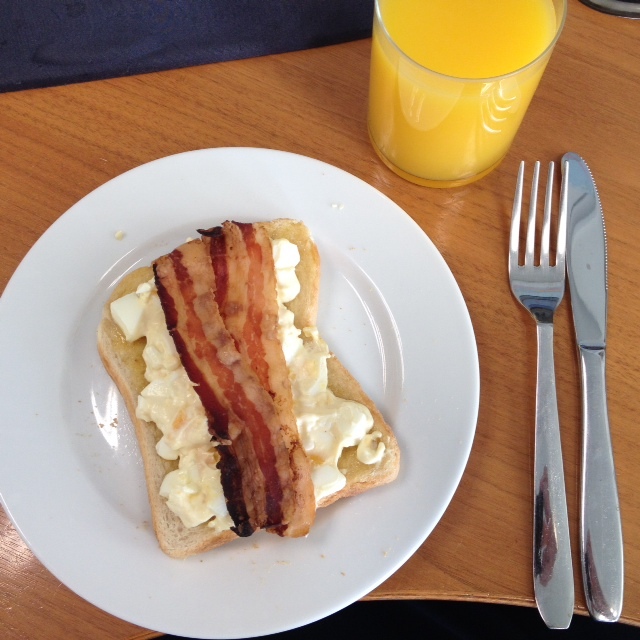 Spread the egg salad on to the bread, top with the crispy pancetta. Serve immediately. 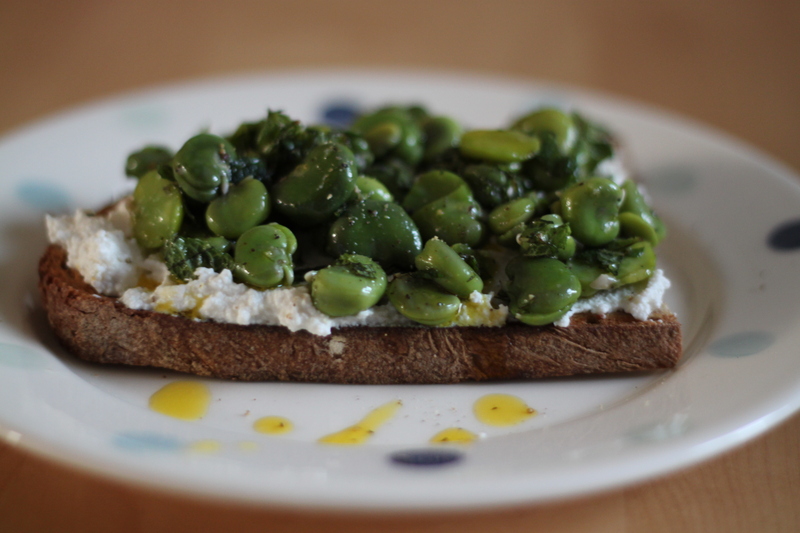 Preparing broad beans is quite time consuming but is, in my opinion, completely worth it. Sometimes I even enjoy such menial tasks and was stood quite happily by the kitchen window preparing these little treasures. I prefer a simple approach to fresh new produce but at the same time want the finished dish to be exciting rather than boring and pairing these little goodies with ricotta, lemon and mint really worked. I had the toast for supper but the toppings would work just as well on crostinis as a nibble before dinner. Toast the bread in a toaster. Leave to cool. Cook the broadbeans in water for about 5 minutes (until they look almost white). Drain and remove the white outer shells. Mix the ricotta with 1 tsp rapeseed oil and the lemon zest. Season well. Mix the beans with mint and the remaining oil, salt and pepper. 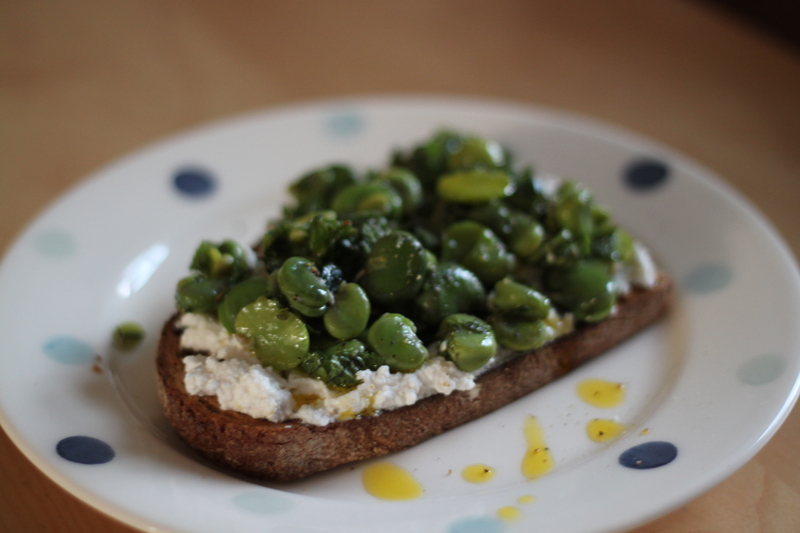 Spread the ricotta on to the bread, top with the broad beans and drizzle with some extra oil before serving.